﻿ Coming to the MCN London show this year? Are you joining us at the Carole Nash MCN London Motorcycle Show this year? We're expecting a record-breaking attendance this year, so, if you are travelling via DLR we recommend that you alight at the Prince Regent stop to arrive at the East entrance for the Carole Nash MCN London Motorcycle Show. On arrival continue to proceed to N6 to enter the show. For the latest and up-to-the-minute travel information, visit our show website. And if you've not yet booked tickets - don't panic! You've still got time to grab tickets at our advanced-booking prices! But hurry, the extended offer runs out at midday on Tuesday the 10th! 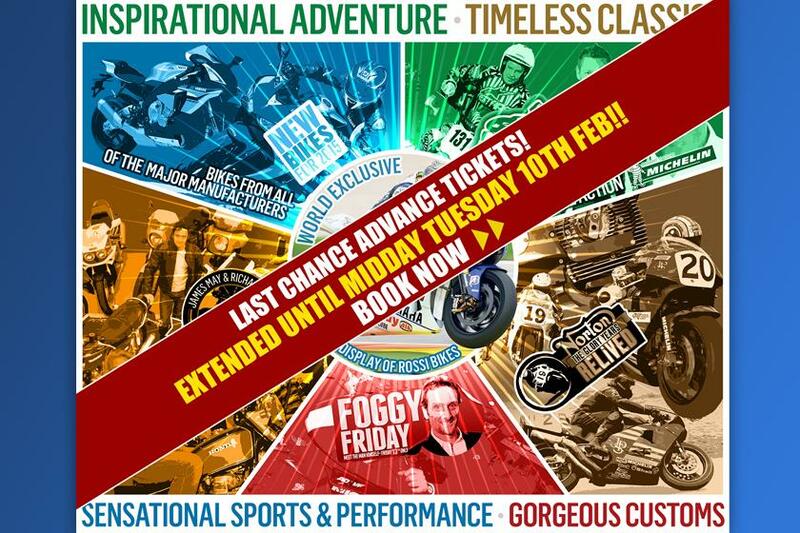 On February 13th - 15th 2015 the whole of the UK motorcycle industry is coming together to create London's most vibrant, action packed, bargain filled, unforgettable live motorcycling experience ever. Discover a show unlike any other bike show you've been to before. It's a multi stage, multi event and multi star-studded show that promises to pack the entire world of motorcycling into one massive weekend.